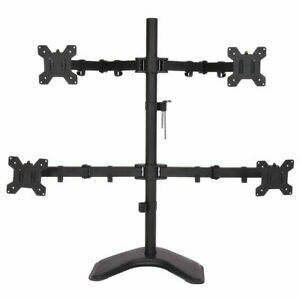 Details about 4 LCD Tilt Monitor Mount Desk TV Bracket Stand Adjustable Arms Swiel up to 27"
Item received as promised, thanks!! Product as described Fast Shipping !!!!!!!!!!!!!!!!!!!!!!!!!!!!!!!!!!!!!!! Really good product and fast delivery and good price, I'll order more. Great price & fast delivery, awesome stand, works very well! Super easy to setup! It took me about 30 minutes to unbox, setup, and attach my monitors. The stand is a little tippy with heavy monitors which makes balancing each side crucial! The arms are definitely heavy duty and can support large monitors. Adjusting the monitor position is easy, just keep the hex key (Allen wrench) handy. The only downside are the brittle cable clips for routing the monitor cables. I broke 2 during setup just trying to get the first cable in the clip. All 4 Monitors are holding up very well, bought at a reasonable price. More that I expect. I buy another.